Time Fcuk is brought to you all by Edmund McMillen, creator of previous Alt+Esc fare Spewer, as well as a bunch of little games that resident Escapist indie fanboy Jordan Deam goes ga-ga over. Time Fcuk continues in the tradition of McMillen's previous games, combining a surreal aesthetic with creative gameplay in a package that constantly pushes the line of whether something is in bad taste or not. Oh, okay, sure. The most potentially offensive thing about Time Fcuk is the title, so it's tame by his standards. 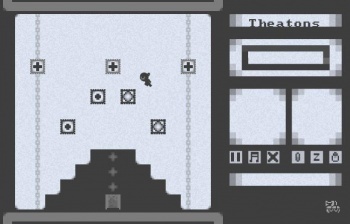 Even then, the point of the title is to play on the human tendency to see something where there is nothing - it's an "allegorical game" in the form of a puzzle platformer "about finding logic in irrelevance." Here's the premise: You're going about your mundane existence when you-from-twenty-minutes-in-the-future shows up in a magical box, tells you that you have to get inside, and then pushes you in. What follows is a surreal little platformer where the primary gimmick is being able to phase between two subtly shifted worlds. Some objects come with you when you phase, others do not, and you'll need to shift back and forth between planes of existence to reach the exit of every test room - while your Future You rambles cryptically at you the whole time. McMillen says that Time Fcuk is "about stuff you've never experienced, its an escape from your current existence, its the feeling of loss and panic." That may be true, Edmund, but for the moment, it's also a way to kill a good chunk of your Friday afternoon as we ease into the weekend.